Upperhouse Glamping offers self catering accommodation in Little Marcle. We are near Ledbury in Herefordshire. The luxurious shepherds hut is perfect for a romantic break for two. 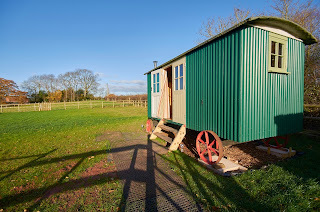 Our brand new shepherds hut is perfect for a memorable break away. 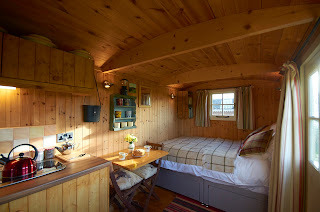 It is fully connected to the mains electrics and water and has a flushing loo. It is in a beautiful field and enjoys spectacular views of rolling countryside. Nearby Alexander Park offers golf, spa treatments and a fabulous gym. The area boasts a wealth of historic buildings including three magnificent cathedrals all within a 30 minute drive, imposing castles, quaint towns and villages.